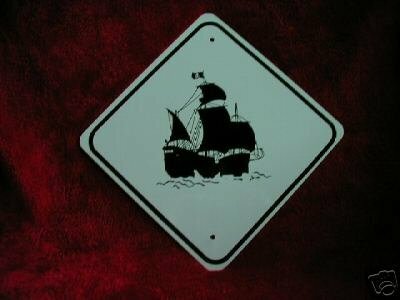 UNIQUE METAL PIRATE SHIP MINIATURE TRAFFIC SIGNS SIGNS ARE 8" SQUARE AND MEASURES 11" X 11" Corner to Corner MINIATURE PIRATE SHIP TRAFFIC (WHITE) SIGN is made of coated .040 aluminum , not thin cheap plastic, It is bright WHITE with black enamal graphics. (not vinyl letters) It is just the right size for room or door decoration. Sign comes with 2 holes and mounting tape. Buyer will add 2.75 shipping. Seller will combinesales to reduce shipping costs. Sellerl will take PAYPAL .Ask for list of 65styles available.. SEE ALL OUR SIGNS ON OUR WEB PAGE AT minitrafficsigns SEE ALL OUR SIGNS IN OUR STORE. On Oct-14-02 at 13:06:58 PDT, seller added the following information: Pay me securely with any major credit card through PayPal!